The cot–caught merger (also known as the low back merger or the LOT–THOUGHT merger) is a phonemic merger, occurring in some dialects of the English language, between the phonemes that are conventionally represented in the International Phonetic Alphabet as /ɔː/ (which is usually spelled with au, aw, al or ough as in caught and hawk) and /ɒ/ (which is usually spelled with o as in cot and hock). In varieties in which the merger has taken place, including a few in the British Isles and many in North America, what were historically two separate phonemes have fallen together into a single sound, so that caught and cot are pronounced identically. Presumably Hilary Price’s intention was that the spelling FRAUG, pronounced [frɔ:ɡ], should represent a combination of FROG — pronounced [frɑ:ɡ] or [frɔ:ɡ], depending on your variety of American English — and FRAUD, pronounced [frɔ:d] for many American speakers, but [frɑ:d] for American speakers who level [ɔ:] and [ɑ:] in favor of the latter (the “COT-CAUGHT merger”: both these words are pronounced [kɑ:t], DAWN and DON are both [dɑ:n], and SHAW and SHAH are both [ʃɑ:]). the phenomenon of phonemic hearing: speakers who have a phonemic distinction between /a/ in cot and /ɔ/ in caught are (keenly) attuned to, attentive to, the acoustic details that distinguish the two for them, but the many American speakers for whom the phonemes have merged don’t get it at all, so from the [point of view] of cot-caught speakers like me, they seem to be hearing-impaired (the effect is very striking). Bizarro. 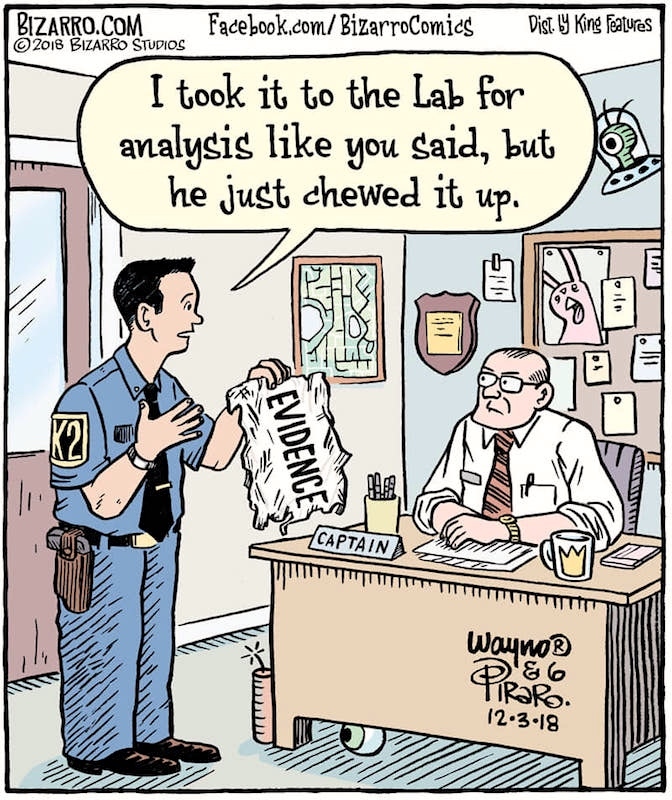 For today: a pun on lab ‘laboratory’ vs. Lab ‘Labrador (retriever)’, a breed of dog. /læb/ can refer to ‘a room or building equipped for scientific experiments, research, or teaching, or for the manufacture of drugs or chemicals’ (NOAD), by clipping of the word laboraory; or to ‘a retriever of a breed that predominantly has a black or yellow coat, widely used as a gun dog or as a guide for a blind person’ (NOAD), as a clipping of the breed name Labrador, itself a truncation by beheading of the breed name Labrador retriever, whose first element is the placename Labrador. Etymology: Alteration of ha ha int. Lippy the Lion & Hardy Har Har is an animated television series [beginning in 1962 and continuing with various distributors up to the present] produced by Hanna-Barbera and aired as a part of The Hanna-Barbera New Cartoon Series starring the animated anthropomorphic lion and hyena pair in a series of goofy misadventures. 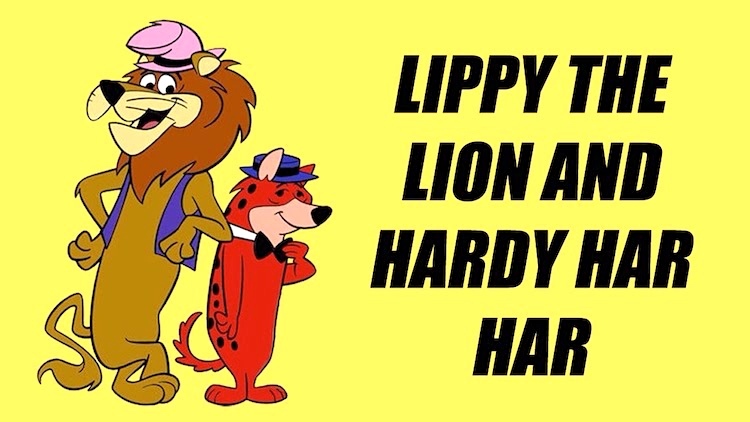 Lippy, a lion wears a tattered top hat and vest while Hardy, a hyena wears a porkpie hat and bow tie. Lippy’s voice, patterned after comic Joe E. Brown, is identical to that of Peter Potamus (both provided by Daws Butler). Hardy Har Har’s name is ironic, as it suggests the sound of laughter associated with a hyena … and Hardy is an eternal pessimist. 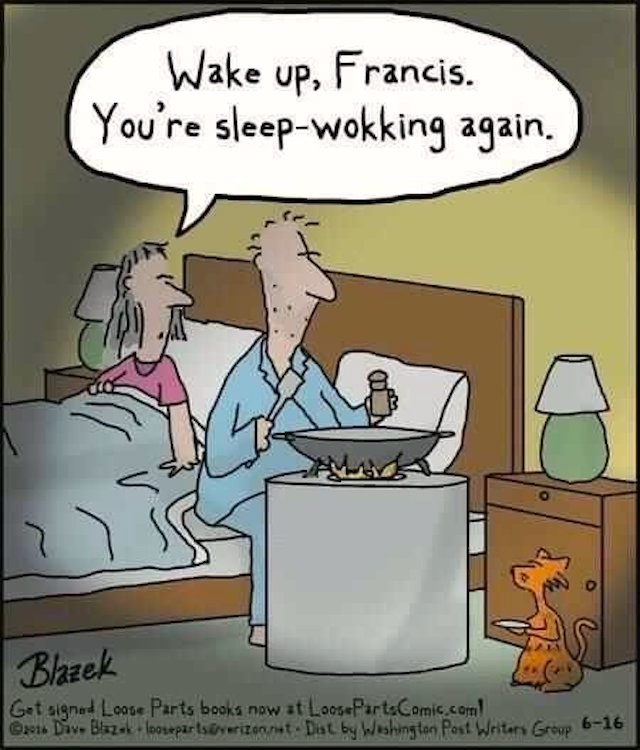 This entry was posted on December 3, 2018 at 1:46 pm and is filed under Abbreviation, Ambiguity, Beheading, Clipping, Linguistics in the comics, Movies and tv, Onomatopoeia, Phonology, Puns, Truncation. You can follow any responses to this entry through the RSS 2.0 feed. You can leave a response, or trackback from your own site. I needed to go to the “Secret Symbols” page as people on the Style Invitational Group on FB were wondering about the eye and pie in a Bizarro cartoon. I followed your link and, sadly, it’s expired. The new link is here. Thanks. I think I’ve corrected my file. I’ll leave your note here, however.